This species is accepted, and its native range is Trinidad, Venezuela to N. Peru. It is used to treat unspecified medicinal disorders, as animal food, an ornamental plant and a medicine, has environmental uses, for firewood and for erosion control. Perennial; caespitose. Rhizomes short; pachymorph. Culms erect; 2000-3000 cm long; 100-130 mm diam. ; woody; with root thorns from the nodes. Culm-internodes terete; thin-walled; 20 cm long. Lateral branches dendroid. Branch complement three; with 1 branch dominant; thinner than stem. Culm-sheaths pubescent; hairy throughout; with dark brown hairs; without auricles. Culm-sheath blade triangular; erect; pubescent. Leaf-sheath oral hairs lacking. Ligule a ciliolate membrane. Collar with external ligule. Leaf-blade base with a brief petiole-like connection to sheath; petiole glabrous. Leaf-blades lanceolate, or oblong; 10-20 cm long; 6-12 mm wide. Leaf-blade venation without cross veins. Synflorescence bractiferous; scanty; 5-10 cm long; lax; with glumaceous subtending bracts; with axillary buds at base of spikelet; prophyllate below lateral spikelets. Fertile spikelets sessile. Spikelets comprising 6-12 fertile florets; with diminished florets at the apex. Spikelets linear; straight, or curved; laterally compressed; 30-60 mm long; 4-5 mm wide; breaking up at maturity; disarticulating below each fertile floret. Rhachilla internodes obscured by lemmas. Glumes persistent; similar; shorter than spikelet. Lower glume ovate; 0.5-0.8 length of upper glume; coriaceous; without keels; 11-17 -veined. Lower glume apex obtuse, or acute. Upper glume ovate; 0.5-0.8 length of adjacent fertile lemma; coriaceous; without keels; 11-17 -veined. Upper glume apex obtuse, or acute. Fertile lemma ovate; 8-16 mm long; coriaceous; without keel; 11-17 -veined. Lemma apex acute. Palea 1 length of lemma; 6 -veined. Palea keels winged; conspicuously winged. Palea surface pubescent; hairy on back. Apical sterile florets resembling fertile though underdeveloped. Lodicules 3. Anthers 6. Stigmas 3. Ovary umbonate. Alt. 10 - 2250 m.
Nativa en Colombia; Alt. 10 - 2250 m.; Andes. Live plant (in situ) - Protection of water resources (Carvajal et al. 2014). Live plant (in situ) - Soil protection (Carvajal et al. 2014). Ornamental (Carvajal et al. 2014). Used as fuelwood (Carvajal et al. 2014). Used for crafts (Carvajal et al. 2014). Used for construction (Carvajal et al. 2014). Stems - Used for construction (Linares et al. 2008). 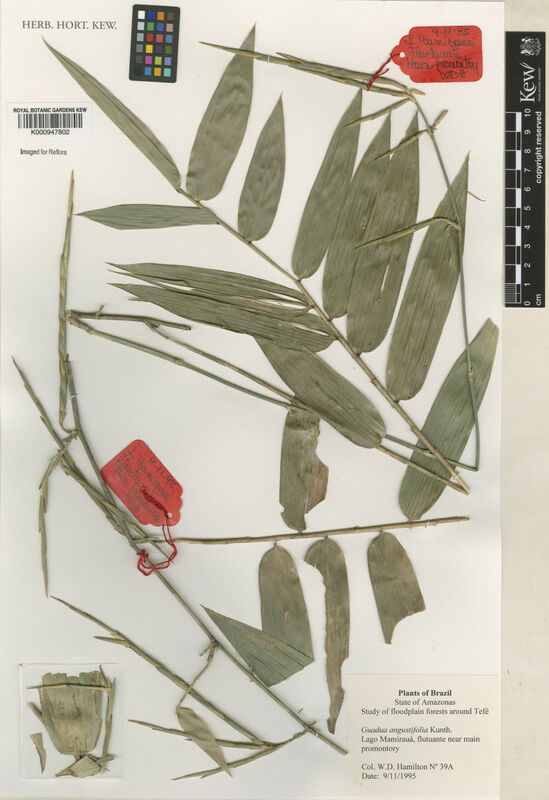 Stems - Used for basketry (Linares et al. 2008). Used to make musical instruments (Linares 1994). Guadua, bambú, bambú nativo, guadua cebolla, guadua macana, yaripa.